In a letter sent to Sri Lanka’s Minister of Rehabilitation, Resettlement and Refugees Jaffna Government Agent (GA) and forwarded to TamilNet "on advise of the Hon. Minister Prof. Jayalath Jeyawardena, MP," the GA, Mr. S. Pathmanathan categorically denied stating that the government of Sri Lanka “had not spent a red cent for rehabilitation and development in Jaffna for the last two years” at a meeting in Chavakachcheri on 27 December. The TamilNet correspondent who covered the meeting and took photographs of the event said he stands by his story. 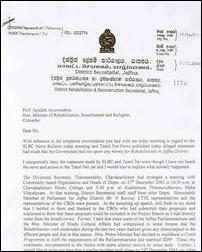 The letter carrying the GA’s denial was given wide publicity in the Colombo press Tuesday and Wednesday. The GA, in his letter to the Minister, states, among other things, that he had not seen the TamilNet report of 27 December. The GA charged that another TamilNet report also gave a twisted version regarding the outcome of the discussion the military had with the heads of government deptartments at the District Secretariat on 24th December 2003. The GA’s statement that the Government of Sri Lanka did not allocate any money for rehabilitation and development in Jaffna was reported by the local area correspondents of the Jaffna dailies Eelanaadu and Thinakkural and was carried by these papers on 28 December. Addressing the Chavakachcheri meeting on 27 December, Director of Planning, Jaffna District, Mr. P. Sunderampillai, corroborated the GA’s statement that funds for Jaffna development and rehabilitation were from international donors and not from Colombo purse. On account of the gravity of the GA’s statement at the Chavakachcheri meeting of 27 December, TamilNet editorial staff discussed the facts relating to the basis on which Mr. Pathmanathan had made the sweeping pronouncement with officials of the Planning Department of the District Secretariat. “The government gave us less than a million rupees for only for administration purposes," said one of them who did not want to be named given the controversial nature of the matter. “The issues raised by the GA in his speech in Chavakachcheri are real. This is the reason why the Sri Lankan government mechanism in Jaffna doesn’t have the capacity to fully utilise even the paltry sum of five million rupees granted to MPs," he added. The meeting in Chavakachcheri on 27 December where the GA spoke was organised by The Divisional Secretary, Thenmaradchy, on the advise of the political division of the Liberation Tigers in Jaffna. 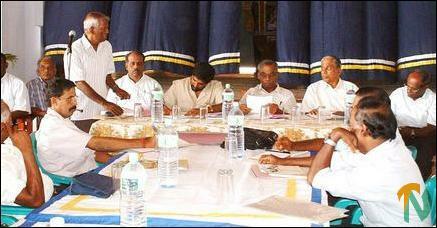 The deputy leader of the LTTE’s political division in Jaffna, Mr. K. Semmanan was present at the meeting. When contacted by TamilNet regarding Mr. Pathmanathan’s denial, said: “The GA said that the Sri Lankan government had not allocated any money for the last two years for development and rehabilitation in Jaffna district. We say that it is the case in all the Tamil areas of the northeast." TamilNet spoke to officials in the Departments of Agrarian Services, Buildings, Fisheries and Irrigation, the Road Development Authority, Urban Development Authority, National Water Supply and Drainage Board regarding the issue of funds from Colombo for the rehabilitation and development of Jaffna in the last two years. All of them reiterated the GA’s statement that such funds had come only from international donor agencies. With reference to the telephone conversation you had with me today morning in regard to the SLBC News Bulletin today morning and Tamil Net News published today alleged statement had made that the Government had not spent any money for Rehabilitation in Jaffna District. I categorically deny the statement made by SLBC and TamilNet even though I have not heard the news and access to the TamilNet yet and I would like to explain what actually happened. The Divisional Secretary, Thenmaradchy, Chavakachcheri had arranged a meeting with Community based Organisation and Heads of Depts. on 27th December 2003 at 10:30 a.m. at Chavakachcheri Hindu College and 3:30 p.m at Kodikamam Thitunavukkarasu Maha Vidyalayam. At that meeting, District Secretariat staff, staff from other Depts. Honourable Member of Parliament for Jaffna District, Mr. N Raviraj, LTTE representatives and the representatives of the CBOs were present. At the summing up speech, still fresh in my mind that I briefed to them and thanked to the CBOs who had submitted their proposals and explained to them that these proposals could be included in the Project Report as it had directly come from the beneficiaries. Further, I said that since some of the Jaffna Parliamentarians and the Hon. Minister of Hindu Cultural Affairs had complained in some forums that the Rehabilitation work undertaken during the last two years had not given any direct impact to the affected people and due to that reason. Hon. Prime Minister had decided to implement a Crash Programme to fulfil the requirements of the Parliamentarians and resettled IDPP. These, my comments, mis-presented to the Media with some ulterior motive by somebody. Further, I would like to point out here that a similar incident took place on 24th December 2003 too when the Tamil Net Report on 24th December 2003 also gave a twisted version regarding the outcome of the discussion the Security Forces Commander, Jaffna had with the Heads of Depts. at the Dist. Secretariat. Further, I would like to reiterate that in order to give more information regarding the Rehabilitation work undertaken by the Government in Jaffna Dist. I had given a special notice to the Local News Paper. Uthayan on 21st December 2003. with three paged advertisement to give an idea to the public about the projects under-taken by the Government in Jaffna District and implemented by this District Secretariat including MRR & R.
This, I hope will give a clear picture of the three paged advertisement is annexed hereto. 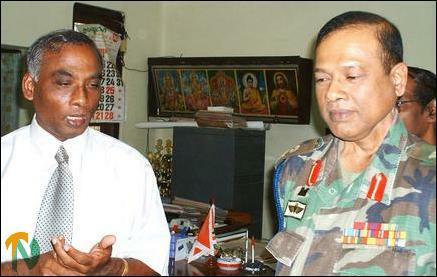 Regarding the GA’s allegation that TamilNet twisted “the outcome of the discussion the Security Forces Commander, Jaffna had with the Heads of Departments at the District Secretariat” on 24th December 2003, we wish to only state that we quoted verbatim what the Sri Lankan security forces commander for Jaffna and Mr. Pathmanathan told the press after the said meeting, which was also covered by the Jaffna press.